I meet and know a load of people who have the fortune to call some little people their housemates. While I’ve never had a full-time little person housemate, I have spent quite a bit of time with them. Some of those people and I regularly bring and store firearms intended for self-defense around those little people we love so much without a single incident. And no, I’m not talking about midgets. Firearms have many purposes. They are great for sport. They can be things of beauty and are often collected. They are also great tools of self-defense. Nearly everyone I associate with uses firearms for self-defense. Some of those people are parents, grandparents, aunts, and, like me, uncles. How do we maintain maximum readiness while making sure inquisitive little people don’t hurt themselves or someone else with our defensive tools? First, let me clarify what I mean my using a firearm for self-defense. A firearm used for self-defense is in a condition where it can be discharged at a threat immediately. That means a round is in the chamber, it is cocked, and a full-magazine is inserted into the magazine well. We call this condition one. 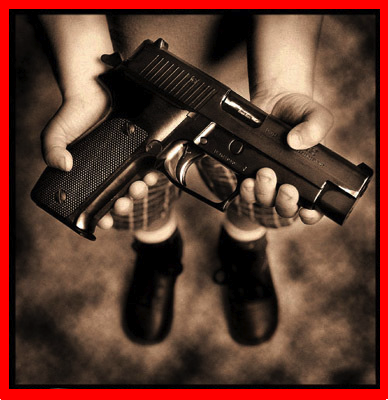 We all hear the horror stories of a baby discharging a firearm due to the negligence of a parent or guardian. They are awful indeed. But they all could’ve been avoided. Notice I called them negligent, not accidental. We’ve also, although not as often because of media bias, heard the stories of a family victimized because they were not able to meet an attacker with tools of equal force. Their tools were locked away secure from the hands of inquisitive little people. That same locking device also kept it out of the hands of the victim adult at the most critical time. Both cases result in the children being the end loser. My goal is to offer you, the reader, advice on maximizing self-defense readiness while at the same time maintaining a safe environment. My goal is help you make decisions that prevent either unfortunate circumstance or tragedy. The most effective means of storing a firearm for self-defense is to wear it. When a handgun is on your body, you have control of it. You know it’s there. You know what’s coming in contact with it. My nieces and nephews love to play with me and I love to play with them. By play, I mean roughhouse. They either like to climb all over me like I am some sort of jungle gym or they like to roll around on the floor wrestling. There is no way you could engage that kind of play while armed free of worry without a solid active retention holster. The best kind is one with a thumb break. There are also some nice serpa holsters. Serpa holsters are nice, but the handgun can be freed sometimes with a push of a button. With a thumb break, a snap must be worked before the firearm is free. Even then, a leather holster with a thumb break will still have some retention even after the break is disengaged. You are also more likely to hear it. 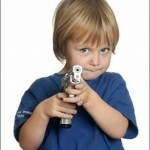 Of course the best way to play worry-free is to just secure the firearm outside of the play area. Every other activity, even carrying a around a toddler, can be accomplished safely while wearing your handgun in a quality holster. The holster need not even be of the active retention type to carry on safely. A quality holster will secure the firearm safely enough for the vast majority of activities. But, I caution against wearing different types of holsters. The use of a self-defense firearm should be muscle memory. For something to be committed to muscle memory, it must be performed thousands of times. That means thousands of repetitions performed exactly the same way. Adding or altering factors exponentially increases the number of times an action must performed before it is committed to muscle memory increases. Instead of having to practice with each holster twice the requisite number of times, you may have to do the same training four or more as many times. Most people don’t have the time to train enough to fully realize muscle memory with one method of self-defense use, much less multiple methods of carry. I train for self-defense with the same gun in the same manner every time. If I were to be in a situation where I thought my play would result in a reduced effectiveness of my everyday carry holster’s retention, I personally would secure the firearm somewhere else. Not every adult has the luxury of being in close proximity of other armed adults while we secure our firearms off-body. I do. If I were in a situation where I wanted that handgun on my body every single waking moment, I either wouldn’t engage in that type of play, or I would switch to a holster with a thumb break. There are times when you can’t really wear a firearm on your body while little people are in the vicinity. How one secures the firearm in those cases depends on the situation. If you lock the door behind yourself before you remove the handgun, you may be able to store it in condition one safely on the nightstand. However, if you are one of the folks who doesn’t, you won’t. Little people will walk in the bathroom when you are in the shower. They will walk into your bedroom when you are asleep. They can do a lot of exploring before you even know they are in the same room. But, you can still maintain effective readiness even in the shower or during slumber. When that handgun is not on your body or behind a locked door with you in such a way that you maintain positive control, the best way to store it is unloaded. Eject the magazine and any chambered round. Store them near each other somewhere out of the reach of curious little people. You don’t have to necessarily lock it up. Should you need to actively use that handgun for self-defense, you can insert the magazine and chamber a round. The only time you should be in such a circumstance, if you want to maximize readiness, is when you are sleeping. During these times a second self-defense firearm, such as a 12 gauge loaded with buckshot hanging from the ceiling or high up on a wall, is a great solution. If you find yourself waking from a deep slumber to the sound of an unwelcomed house guest, you can chamber that shell making a very distinct sound. Nothing says “get out of my house” quite like the click-clack of a 12 gauge slide chambering a shell. If that doesn’t, you don’t need excellent marksmanship skills to effectively neutralize a threat. Buckshot is also less likely to fully penetrate walls when shooting down a hallway along the length of walls than a slug or handgun. Everyone will agree that the best way to store a firearm around little people is behind lock and key. But that storage method reduces self-defense effectiveness. 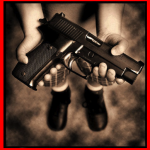 Understand that toddlers and small children do not possess the dexterity and/or strength take a magazine separate from a firearm and make the firearm condition one. Nor do they possess the dexterity and/or strength to rack the slide of a shotgun and chamber a shell. There is no absolute reason you can’t store the firearm with that in mind. The key is a marriage between self-defense effectiveness and safety. Once the little people are in a position to reach the firearm and can make it condition one, it’s time to start shooting with them. At that point, you are going to have to learn to trust your smaller housemates. 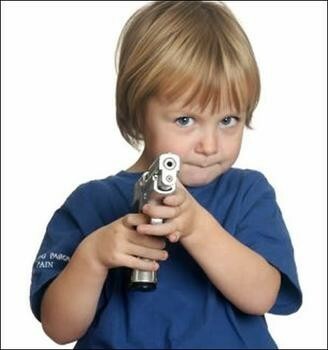 Introducing your children to firearms early and teaching them that they can only use them under adult supervision actually works. They learn respect for the firearm. They are approaching an age where they are able to understand implications of their actions beyond an immediate form of punishment. However, I am not educated in child psychology nor am I a parent. I definitely can’t speak from a position of authority and this is where it gets grey. I do know based on my experience and what I observe that teaching children the desired behavior early produces desired results later. Each child is different and not every method works. Once the little people are able to operate the firearms, the decision on how to store the firearm becomes more subjective. But it still doesn’t negate the fact that you can safely wear it on your body. As a disclaimer, I will say that I am not a parent or have any formal education in child behavior and psychology. I have however done extensive research into this matter. I have also consulted people recognized as experts in both fields. The previous advice is the best I can and do offer my students and my friends. It is not meant to be parenting or legal advice and should not be followed if your gut tells you different. You are ultimately responsible for your actions and safety, including self-defense readiness, as well as the safety and defense of the little people and other young adults in your charge. Carry safely, my friends. I hope this helps.